Because a baseball glove is made of a natural material, proper care is especially important. Basic maintenance protects your investment by preserving your glove’s appearance, enhancing its performance and extending its life. Condition your glove regularly with top-quality glove oil. Never use shaving cream or petroleum jelly on a glove. Cover the entire glove surface including w here your hand is placed, to soften, restore, waterproof and protect the leather. Do not over-oil a glove — a common mistake. Simply apply one or two light coats and rub the oil in with your fingers or a cloth or sponge. Allow the leather to dry for several minutes between coats. Continual over-oiling traps lubricants and can make a glove too heavy, which slows your reaction time on the field. For best results, clean your glove first with leather cleaner. Rinse off soap thoroughly with a little water taking special care in and around stitching holes. Allow your glove to dry naturally; do not put in the sun to dry. Sweat and infield dirt are among your glove’s worst enemies. Accumulated dirt and grime absorbs necessary oils and dries out the leather. Unless these oils are replenished, the loss of lubricants can cause the leather to stiffen and crack. 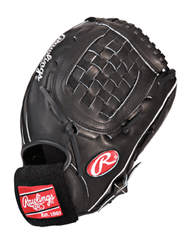 Once leather is cracked, all the soap and oil in the world cannot recover your glove’s original look and feel. Avoid storing your glove in extreme heat such as the trunk of a car or under a window where the sun’s heat is magnified. Leather has “memory.” If you choose, use the fat end of a baseball bat to mold and work in the pocket and/or wrap a baseball or softball in the glove pocket with a strap or rubber bands around the glove and store it that way over night. Protect your glove from excessive or prolonged wetting unless you want the leather to stretch and shrink some during the new glove break-in process. But remember that as leather dries the evaporated water takes oil with it — so recondition your glove with glove oil once immediately after it dries. Always try to cover your glove with a clean cloth when storing it. This prevents dust from building up and entering the pores of the leather. Make minor repairs to broken or loose stitches right away before they become larger, more expensive problems.